So, after a lovely holiday with patchy, if ever working "free wifi" internet connection, I am now back at home linked up to my lovely broadband with an internet connection that means I can upload whatever I want to the world wide web (hurrah!). 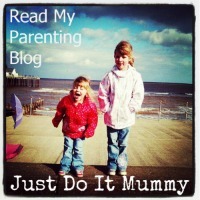 Today I am introducing (or perhaps reintroducing) a new feature to the blog: Veggie Spots. Veggie Spots will feature a round-up of Vegetarian news, products and items each week - so here goes! Daisy's Urban Cafe in Lowestoft, Suffolk. 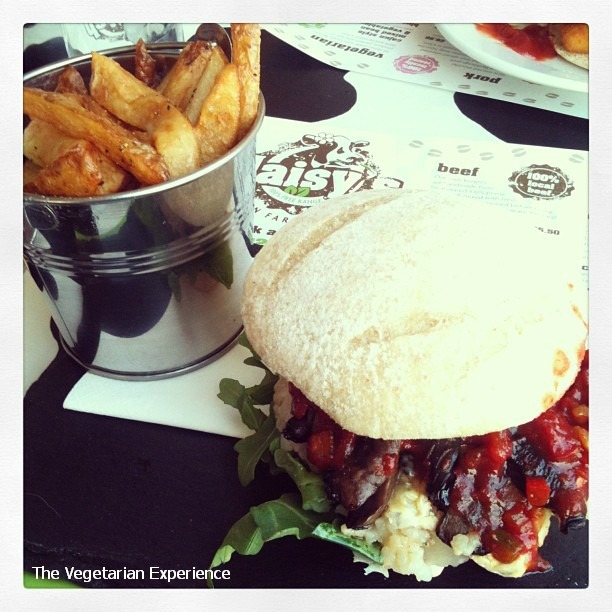 I enjoyed a delicious Vegetarian Burger at the newly opened Daisy’s Urban Café in Lowestoft Suffolk during our holiday recently. I had the Blue Cheese and Flixton Mushroom Risotto served in a Burger Bun with Chips. It was absolutely divine - fresh ingredients and freshly made. 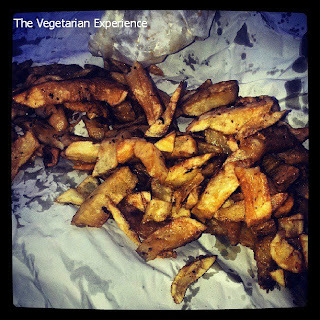 They have some fantastic Vegetarian options, and also some great meat options too – all locally sourced. The kids loved their freshly made milkshakes, which were included in with the kids meal offer, and they also serve other milkshakes and ice creams made with local ingredients in really interesting flavours. We received fantastic service, and I think this restaurant deserves to be busier than it is, for offering something different in the local area. I just hope it's still there the next time we visit. Do go and give the restaurant a try, and spread the word if you are in the local area. Daisys Urban Farm Kitchen don't seem to have embraced the internet yet - but they are right opposite the harbour in Lowestoft as you enter the town centre from the beach - definitely worth a look! The Mermaid Fish and Chip Shop - Lowestoft. From a really good meal, straight to one of the worst places I have ever visited. I ordered a "Vegetarian Burger" which I was then informed could only be served cooked in batter - and cooked in the same fat as the fish and everything else was being cooked in. I declined the Veggie Burger, and got hassle for daring to ask for something Vegetarian. I then ordered food for the rest of the family as there wasnt much else available. I wish I hadn't bothered, the food was absolutely revolting (see picture - disgusting!) I also received what can only be described as abuse, and shockingly bad customer service for daring to order something vegetarian - it just goes to show how pig-headed some people really are in thinking that its enough to have a token vegetarian menu item, but still cooking it in the same fat and wrapping it in the same packaging as fish and chips. Those who are serving vegetarian food alongside non-veggie food really need to get their kitchens in order to make sure their food actually is vegetarian if they are advertising it as such. Very disappointing. 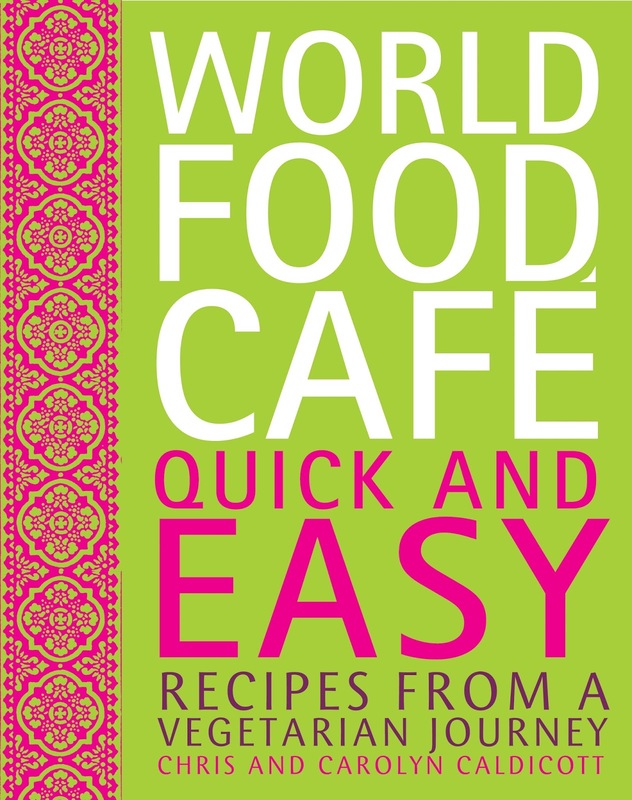 “World Food Café – Quick and Easy Recipes from a Vegetarian Journey”. A new vegetarian recipe book has recently been published by Chris and Carolyn Caldicott - "World Food Cafe - Quick and Easy Recipes from a Vegetarian Journey"
This is a great recipe book which features Vegetarian dishes from various countries of the world including Bangladesh, Japan, Laos, and Chile. 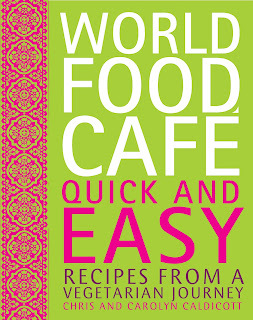 The third in a series of World Café recipe books, this book details recipes collected by the authors on their journeys around the world. Each section includes a write-up about the country and typical ingredients and dishes found in the country. The great thing about the recipes in this book are that they originate from all kinds of different places – cafes by the side of the road, mountainside cooking tents, home kitchens, pop-up events and more up-market restaurants - so there is a real variety of recipes featured. There are some interesting recipes such as Lychee and Rose Coconut Milk from Burma, Mushroom Cerviche from Chile, and Chakalaka from Namibia. I really like the look of some of the recipes in this book. Although some of the ingredients may be a little harder to sources in some places, we are quite lucky in that we have some great international food sections in the larger supermarkets and so the ingredients will hopefully be readily available in most places. If you are already an accomplished cook, and you like to use interesting ingredients to create delicious new dishes from around the world, then this is definitely the book for you! “World Food Café – Quick and Easy Recipes from a Vegetarian Journey” is available from all major retailers, with an RRP of £20 and is published by Frances Lincoln Publishers. Disclosure: Book sent in consideration for review. Cookery writer and TV Chef Anjum Anand, who hosts the TV cookery show "Indian Food Made Easy" has a new range of original sauces developed under the banner of "The Spice Tailor". Anand's visison was to develop a range that is authentic, tastes homemade and doesn't take too long to prepare. 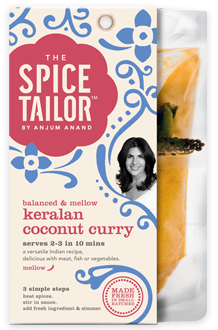 Sauces in The Spice Tailor range include: Original Tikka Masala, Rustic Rogan Josh and Keralan Coconut Curry. I was sent one of each sauce to sample. I really liked the way that they are packaged - you receive the base sauce, then the sauce to add extra flavour. Specially selected spices accompany each sauce, for you to add at your leisure. I think that this is a really fantastic way to package the sauces as they look really interesting, and it also takes the guess work out of how much of each spice to add. The sauces are all vegetarian, and made with fresh ingredients with no artifical colours, flavours and preservatives. They are a great addition to your kitchen cupboard, especially if you sometimes find yourself short of time to cook as I do - you can knock up an absolutely delicious curry in less than fifteen minutes - amazing! You could also opt to slow cook the dish to allow the ingredients to marinate together over an hour or more for a really rich-tasting curry - whichever you prefer! As the autumn approaches, I think this could be a great thing to use in the slow cooker - bung all of the ingredients in the slow cooker with your vegetables or other protein, and leave to cook all day. I can just imagine coming home to a delicious curry in the evening, knowing that it was prepared with minimum fuss. Some new research this week, found that a vegetarian diet may help protect against heart disease and cancer. Researchers in Dumfries, Scotland, found that levels of salicylic acid - the active ingredient of aspirin, are up to twelve times higher in vegetarians. An analysis of blood samples from thirty seven vegetarians, and thirty nine fish and meat eaters found a striking difference in levels of salicylic acid, suggesting that a vegetarian diet may play a role in protecting against heart disease and reducing the risk of certain types of cancer. However, the rise in the salicyclic levels of a vegetarian diet does not act as a substitute to actually taking aspirin. Researchers found that those (such as diabetics) who regularly take aspirin to lower the risk of heart disease had even higher salicylic levels than vegetarians. A plant based diet, rich in fruit and vegetables may behave like aspirin to reduce the risk of heart disease and cancer - and that can only be a good thing - another thumbs up for the vegetarian diet!